The assignment: Deliver an American-made supercar to the Big Apple. But where to put the luggage? NEW YORK (CNN/Money) - The people at Ford Motor Co. asked me to do them a little favor. 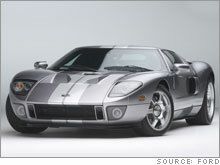 They needed someone to drive a Ford GT -- America's Ferrari, the Motown Millenium Falcon -- from the company's Detroit-area headquarters to New York City. So I thought about it. Let's see... 550 horsepower... 205 mph top speed... 633 miles city-to-city. By any calculation, this car is wicked-fast and silly-fun. As any racing aficionado will tell you, it's an amazing modern replica of a storied racecar. The original Ford GT40s kneecapped Ferrari's prancing ponies at LeMans during the '60s. As such, today's Ford GT is a largely theoretical proposition. Like the original, this version is designed for a world with no serial slowpokes, no speed limits and definitely no bridge abutments. Surround every federal highway with giant mounds of crash-absorbing yogurt, and everyone should drive a Ford GT. Fortunately for public safety, only about 3,500 to 4,000 GTs will be hatched before production ends next year. After an embarrassing hiatus to replace potentially fragile suspension control arms, the cars are again trickling out to owners who'll gladly pay over $200,000, a huge markup over its (again) theoretical base price of $143,345. Even that price is more than fair for a car with all the supercar bona fides: A lightweight aluminum frame and body; a supercharged 5.4-liter V-8 proudly on view beneath the rear clamshell decklid; the moves to tango with the Ferrari Enzo, Porsche Carrera GT and Mercedes McLaren SLR, cars that cost two to three times as much. Yet once you manage to climb in – try to avoid whacking your head on doors that cut sharply into the roof -- the GT proves one of the easiest, most pleasurable exotic cars to drive. Clutch effort is surprisingly light, the tire grip is seemingly without limit, the handling is poised and forgiving. The ride even makes decent peace with potholes. There's no traction or stability control, though, a real oversight considering the car's scary capabilities. You can reach 60 mph -- without leaving first gear -- in an amazing 3.4 seconds. Second gear is good for 95 mph, third for 135-plus. That still leaves three more gears. Detouring from Pennsylvania's I-80 for a blast through the green Appalachians, I found myself engaged in what I called "speculative driving." As in, I wonder how hard this thing will corner before my pancreas shoots through the passenger window? Massive brakes, including Brembo four-piston calipers up front, bring the GT to heel with ridiculous ease. The sound is the sole performance letdown, a too-subdued note accompanied by the breathy whine of the V-8's supercharger. Compared to the stirring, naturally-aspirated lungs of a Ferrari, it's like listening to Clay Aiken after a Pavarotti concert. In response, Ford Racing has begun offering owners optional exhaust systems with a more-robust sound. As pure homage to the original, the GT remains absolutely beautiful -- its terrifying shape rising barely 44 inches from the pavement, trailing swirls of testosterone in its wake. I urge all you celebrity millionaire car shoppers to order one in black, like my tester, which also skipped the optional, $5,000 racing stripes bisecting the car. It looked more sinister and stealthy than the usual red, yellow or white versions. More than one onlooker dubbed it "the Batmobile." Inside, the Ford betrays its Detroit origins a bit. Its Speed Racer look is coolly functional, with a cue-ball shifter, meaty toggle switches and outstanding carbon-fiber shell seats. Yet the black-and-metal cabin gives off a bare-bones vibe, not the sensuous, hand-crafted feel you'd expect for the price. Practicality is a sore spot, even allowing for the car's "speed-is-everything" nature. There's no trunk, not even a glove box. There's just a space under the hood that, on my trip, barely managed a toiletry kit. Tiny cargo nets behind the seat will hold your stack of speeding tickets, but not much else. At every stop along the way, people of all ages and stations approached the car to express appreciation -- not least for the Ford's heritage and status as an American exotic. I felt a warmth and sincerity there that I haven't always experienced in a Ferrari or the like, cars that -- for all their greatness -- cause some to avert their eyes and others to privately mock the driver's ostentation. Easing into Manhattan, the GT slowed from its New Jersey gallop to canter on a parade lap along the Hudson. We'd spent twelve hours together, enough for any driver. But if Ford had asked me to turn around and head straight back, I would have gladly mashed the gas.